One of the things that makes traditional Bavarian costume so special is the materials it is made from and the way it is made. For lederhosen, only the finest leather will do and the workmanship has to be expert; and although dirndls tend to made from simpler fabrics, the level of detail requires real tailoring savvy. Although they’re called lederhosen, or “leather trousers”, the lederhosen you’ll wear at the Oktoberfest have little to do with chaps, biker’s gear, or any other kind of shiny leather goods. That’s because they’re not made of cow’s leather, but from far softer, less polished materials: the more basic versions use goatskin, while the finer lederhosen are made from buckskin or deerskin. Especially the leather made from deer hides is far softer and more velvety than leather from cattle, and the end result are breeches that have sturdy, supportive structure while remaining supple and comfortable. Classic lederhosen have double-sewn seams on the sides and down the back, two front pockets, and the characteristic front flap. The flap can be unbuttoned on both of its top corners, as can the braces (suspenders) which are included with most breeches sold (either H or Y shaped); the trademark cream-brown marbled buttons are made from deer antlers. Since lederhosen are intended to last a lifetime, there are laces at the back to allow them to “grow with their owners”, while the brace belts are buckled so that can be extended around and over any “protrusions” in the belly area. Knee-length lederhosen also have laces to the side at the bottom of the legs; shorter lederhosen tend to have two or three buttons placed at their hem. Historically, dirndl dresses have been made from a variety of materials, including linen and wool. Most dirndls nowadays, especially for summer wear, are made from cotton. The core of any dirndl is the bodice, or corsage, which sits just above the wearer’s hips and just below her bust; it has shoulder straps – often highly embroidered with floral or other motifs – and a lace-up front (often set over a colourful background fabric). On traditional dirndls, the lace-up front is used to loosen or tighten the bodice to suit the shape of the lady wearing it; in many modern designs, it has become entirely decorative as zips are placed on the back of the bodice. The skirt of the dirndl is attached to the bodice and falls loosely but not lightly away from the legs. As traditional women’s dresses were usually intended to be worn with underskirts (petticoats), the skirt on a dirndl dress is lightweight and doesn’t tend to look “full” without something under it. The apron, meanwhile, is tied at the waist and is generally made from a fabric with some sheen to it – silk and satin are of course the most luxurious versions, while the most widespread (and hard-wearing) type is polyester viscose. Dirndl blouses are generally either cotton or poly-cotton, and feature either embroidered or ruffled hems around the bust and on the sleeve hems; puff shoulders are often features, as are lacy or chiffon arms. At the Oktoberfest, you’ll see a full range of dirndls and lederhosen, from cheap and nasty versions acquired at Munich station through to hand-made pieces brimming with tradition and creativity. 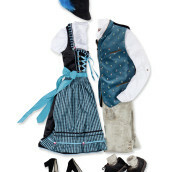 Tracht, or truly traditional Bavarian dress , is especially elaborate, with a range of details like embroidery or hat accessories to watch out for. So if you see something that catches your eye, ask the person wearing it – they’ll probably be delighted to tell you about it!